36v 14a Deep Cell Battery. 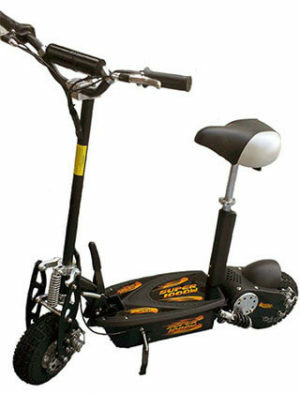 The PE-1000 watt scooter has the newest 1000 watt motor which is 6.00″ x 4.25″ in size, upgraded to 2850 rpm & uses the powerful 1000 watt 33 amp smart control box. This high end scooter has many new features for the coming year. It comes standard with top of the line front and rear disc brakes, chrome front mono-swing shock, dual rear adjustable shocks, solid steel frame, folds in seconds, adjustable & removable seat posts, HUGE 11″ on / off road knobby tires for super stability. 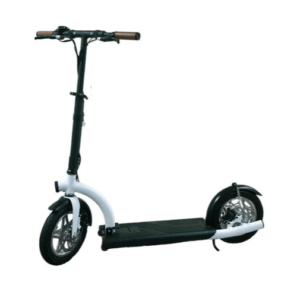 It includes attributes not found on other electric scooters such as: key switch ignition, turbo/econo button w/ battery indicator, deep cell lead acid batteries. It’s the fastest 1000 watt electric scooter on the market reaching speeds up to 28mph on flat roads and 33mph max speed down hill. The PS-1000 has a powerful 1000 watt motor. RPM is at 2850 and the motor is 6.00″ x 4.25″ in size. The battery pack is a high quality DEEP CELL 36 volts system with 6 more total amps then any other Deep Cell battery pack you can buy in the USA. You can charge this battery pack for up to 400 times on average compared to 250 times with the standard 36 volt battery pack. 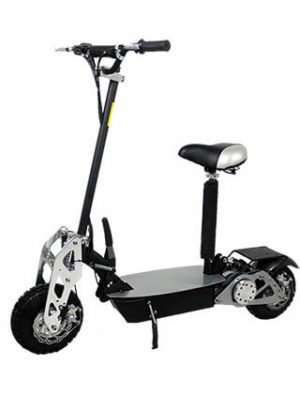 We have added the highest quality Front Chrome Mono Swing Shock as well as SOLID CHROME FRONT FORKS to this scooter. It is the top of the line front end assembly you will ever see on a scooter, which gives this scooter the smoothest most stable ride you could possibly ever have. BATTERIES: THE HIGHEST QUALITY UL Listed 36VOLT SYSTEM. Consists of (3) 12volt 14amp Platinum Series DEEP CELL led acid batteries wired together to create a powerful 36volt battery system. BATTER LIFE on average is 400 CYCLES on average. TOP MAX SPEED: 28mph (Based on 150 lb. rider on a flat road) & 33mph max downhill speed. MAX RIDER WEIGHT: 300 lbs.